For many anglers, the spinning reel has a better lure as the preference of the reel. It is very easy to use and also doesn’t need any learning to handle its casting reel. Fishing reels are pieces of equipment that hold, release, retrieve fish. They have a handle attached to a spool that engages a braking line to slow fish from taking all the spool line, and it has a bracket for attaching the reel to a rod. It is quite easy to learn how to spin a reel and it is very versatile when fishing in different conditions. With this is mind, it is very important that you purchase a reel that will work for you. Your fishing buddies may have a few recommendations or you may already have your eyes set on a particular product. There are lots of spinning reels on the market and it can be easy to become overwhelmed with the choices on offer. We take a look at some of the best spinning reels on the market, to help you make an informed choice before splashing out. We have featured fishing reels to cover a number of budgets and we are sure that the prefect fishing reel for you will be amongst out favorites. The Pflueger Patriarch Spinning Reel is without doubt the best spinning reel you can buy. This sounds like a very bold statement but it is one that we stick by. As well as being the best on the market in terms of performance, we believe it to be the best reel in terms of value for money too. Quality wise, we need to give this reel top marks ad it is lightweight and functions smoothly, with no dragging which can be an issue with some fishing reels. The spool of the reel is ready to use, so there is no need to fiddle about, you can use as soon as you open your package.The grip on the reel is excellent and we have not slipped once whilst trying it out, again something that is annoying for anglers when they invest in lower quality reels. The reel is constructed from magnesium and has carbon fibre in a number of delicate areas of the reel. Sometimes reels can feel too heavy but Pflueger are spot on when it come to weight. Both the spool and handle are made of the carbon components and is designed to be very durable without whilst maintaining a lightweight feel. A drag system that is sealed inside the spool and a solid sure-click bail provides an audible signal when bail is fully opened and ready to cast. There are not as many settings on this reel as we would have liked, with only 3 settings of full lock-down, fully open and medium. To gain any significant amount of counter pressure you need to wind the drag knob down. Stopping power was also a slight issue, but overall this fishing reel has put a big smile on our faces and we are sure it will become a firm favourite for many. The Okuma Trio High Speed Spinning Reel features a very creative design that is a far cry from some of the more traditional fishing reels. Whilst we do not like to stray too far away from tradition we feel that brands are doing an excellent job of listening to what us anglers really want. The brand’s unique “Crossover Construction” have used the best components from traditional materials such as aluminium and graphite, but used them to design a lightweight and durable reel that blends tradition with modernity. By using stamped aluminium rather than regular die-cast aluminium, Okuma was able to make the reel stem much more rigid and take the stress off the two graphite side-plates, keeping the reel lightweight and all internal parts in perfect alignment. The rotor system also features the same Crossover technology with its stamped aluminium rotor arm and graphite rotor housing. A Corrosion-resistant coating processes, penetrates and bonds to the metal for extended durability. We are also fans of the computer-balanced rotor equalizing system that is a clever innovation from the Okuma team. This modern fishing reel has been named after the whale and is equally as strong and formidable. This reel is great for salt-water due to the clever use of materials the brand have used. Aluminum spools and ball bearings made of stainless steel, amongst some of the materials uses, allow for great durability and the salt water will struggle to erode this reel. This fishing reel is great for both saltwater and freshwater fishing, something which can be hard to find despite so many good brands on the market. For anglers who cannot afford a lot of equipment, this reel is a great multi tasking reel. The drag performance in the real is amazing and the real takes on a lot of weight so you can be confident when reeling in a large catch. To put this into context, on the lower series of this reel the drag is an impressive 12 kilos and at the highest series it can drape up 14 kilos, good hey? We have honestly found it pretty hard to think of any negative comments about this reel and it seems a lot of anglers are feeling the same way. This model is a more advanced edition of the Spinfisher series reels. The Spinfisher V. Series spinning reels are made with Penn’s new Water Tight Design which protects the reel from saltwater entering the drag system or effecting the gears. The Spinfisher V. Series reels have many impressive features such as the rubber gasket that keeps the super line from slipping. One other aspect of this reel that we like is the line capacity rings, so that you will always know where you are when battling a strong catch. This reel has a full Metal Body and a side plate keeps the gear alignment precise when taking on heavy weights. This is an extremely durable reel that will keep you happy for many years to come. This is a more expensive model than the reels that we have featured so far, but we think it is a sound investment if you are serious about fishing. Fishing reels do not always require you to splash a lot of cash as there are some great quality products on the market at affordable prices. This Supertrip fishing reel is very competitively priced and has won rave reviews from novices and experienced anglers alike. SUPERTRIP (TM) was founded on the vision to bring the creative life. The development team is very innovative and has been good at getting ideas and inspiration off of the ground to make the product easier and smarter. 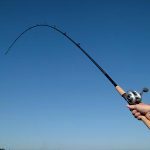 Whilst some of the features seem dated compared to some of the newer models of reel on the market, they all do the job at hand and make fishing for large catches a whole lot easier. A smooth handle made of wood makes the grasp both comfortable and effective and the drag system is very efficient when catching heavy loads. There are questions over how effective this reel is in saltwater, with some negative feedback received, but nothing that we have experienced so far. The majority of this reel is made of aluminium and has proven to be very durable, so it is definitely a wise investment. We hope that we have given you insight into some of the best fishing reels on the market and that you have come to a decision as to what reel is best for your needs. The best advice we would give you is to read over our review again, look into the details of each products and stay focused on what you really need to get out of your reel. We hope that you enjoy many happy years of fishing after you decide to take the plunge with your fishing equipment.